Georgia Tech has approved a 42,000-square-foot project for their campus that aims to pass the Living Building Challenge; construction could begin as soon as this fall. The project began when The Kendeda Fund (an Atlanta-based private foundation) gifted $30 million to Georgia Tech specifically for the creation and operation of a Living Building at the school. (A Living Building has passed the Living Building Challenge's (LBC) stringent standards, which range from energy performance to social equity). The school then hosted an ideas competition and selected a joint design from Atlanta-based Lord Aeck Sargent and Seattle-based The Miller Hull Partnership. The university’s Planning & Design Commission approved the scheme in December and the project has now moved into the design development phase. Despite its approval, the project has presented some challenges due to its lack of programming specifics. A committee of faculty members from Georgia Tech has been working with the design team to refine the program and make sure it addresses the needs of the university. For now, the building program consists of offices, labs, “maker spaces,” classrooms, study spaces, and an auditorium. The program is housed in two rectangular “sheds” joined by a large atrium and featuring a west-facing porch. The structure will be a post and beam system made of locally sourced glue-laminated timbers, adhering to the LBC's strict material requirements. 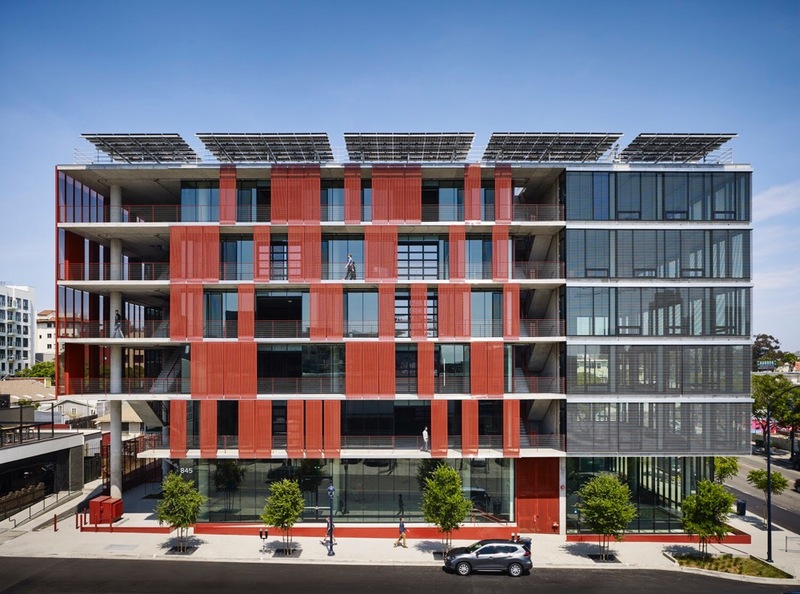 In order to meet the performance standards of a Living Building, the project must also produce 105 percent of the electricity it uses through renewable clean-energy means. The current scheme will use a combination of radiant pipes for heating and cooling, a custom Dedicated Outdoor Air System (DOAS) for dehumidifying the Georgia summer air, and photovoltaic panels on the roof to generate almost 300 kilowatts of electricity. As part of the LBC’s Urban Agriculture requirements, the project must set aside a certain percentage of the site for agriculture initiatives, or 12,577 square feet in this case. Philadelphia-based Andropogon Associates, the landscape architects for the project, is proposing many strategies including pollinator gardens, blueberry orchards, medicinal plants, and edible vines spread across rooftop gardens and surrounding forest to help with water drainage and shading for the building. Lastly, the building will utilize a combination of “foam-flush” composting toilets and a greywater treatment system to recycle wastewater from the building on site for use around the campus. The building is currently expected to begin construction as soon as this fall. The Kendeda Fund has set up a timeline of the project on their website to keep track of its progress through the many design and construction phases. To learn more, visit the fund's project description and timeline. Work is underway on MarketFront, a multi-level extension of Seattle’s Pike Place Market designed by The Miller Hull Partnership. The project broke ground in late June after an extensive community and city process. At stake is the question: How do you create an addition for an icon? The answer: Carefully. “It's a huge responsibility,” noted architect David Miller, a founding partner of The Miller Hull Partnership and lead designer on the project. “We’ve listened to the client and to the people who live and work in the community. Twenty to thirty people would come to every public meeting and ask good questions. The group was strongly opinionated, but also very smart and artistic.” Pike Place Market is more than simply a spot where some ten million tourists come each year to watch fishmongers gracefully toss salmon, it’s a historic site that survived urban renewal and as one of the oldest, continually operated farmer’s markets in the country, it is home to dozens and dozens of local vendors and artisans. It’s critical that Miller and team preserve the character of the market as they weave a new structure into a context of converted warehouse buildings on one side and the soon-to-be-demolished Alaskan Way Viaduct on the other. The design maintains the language of the older buildings through utilitarian materials—wood, steel, and concrete—that echo the industrial architecture. 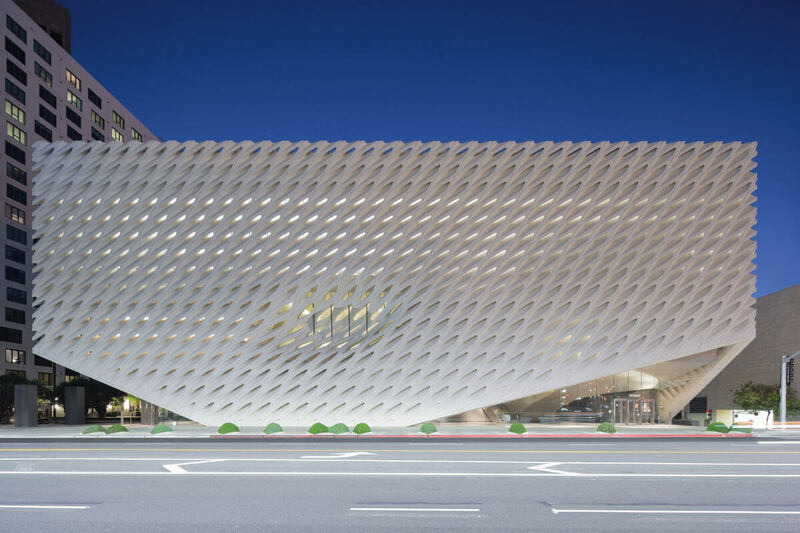 “It is really a utilitarian, no frills structure,” explained Miller. With that simple pallette, The Miller Hull Partnership added 47 new daystalls for farmers and craft artists, new retail space for a brewery and brew pub (including grain silos), and 40 affordable housing units for seniors, some with outdoor space for them to set up their own stalls. The scheme also includes social services—low-income day care, a food bank, and medical services—and parking for cars and bikes. The $73-million dollar project is located along Western Avenue, the street just behind the famous portion of the existing market topped with bright red letters. A two-story structure that is more landscape than building, it occupies the site of the former Municipal Market Building, which was torn down in 1974 after a fire. The new building features an expansive roof deck that offers and preserves views of Elliot Bay and the waterfront. Reached via Pike Place Market’s Desimone Bridge or stairs leading up one story from the street, the deck is part of a 30,000-square-foot public space that terraces down from Western Avenue to the Viaduct—a drop of roughly 85 feet. 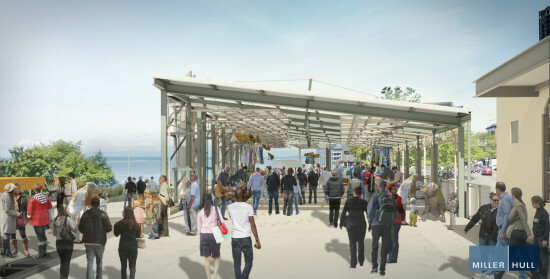 Once that roadway is removed, the MarketFront will serve as a pedestrian connection to the Seattle waterfront designed by James Corner Field Operations, which will stretch along Elliot Bay from Seattle’s Pioneer Square to Belltown. “The Pacific Northwest has this great environment that allows for connecting to the outdoors,” said Miller. “Even though it is in the middle of the city, it is a blend of landscape and architecture.” The project is scheduled to open prior to the final demolition of the Alaskan Way Viaduct in 2016. Robert Hull, FAIA, founding partner of The Miller Hull Partnership, has died from complications following a stroke. Hull, who was 68, was on sabbatical in Port Elizabeth, South Africa. He is survived by his wife and two sons. Hull earned a bachelor of architecture from Washington State University, where he met his long-time business partner David Miller. From 1968 to 1972 he served in the U.S. Peace Corps in Afghanistan. There he designed and built the headquarters for the National Tourism Agency, helped establish an architecture program at Kabul University, and designed more than 100 sustainable schools. Upon his return to the United States, Hull worked in the New York office of Marcel Breuer. 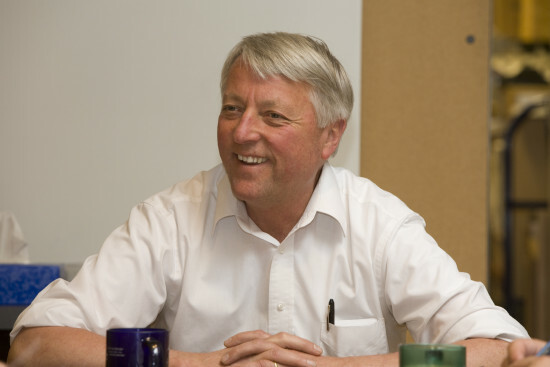 He joined Rhone and Iredale Architects in 1975 and, with David Miller, opened the RIA Seattle office. Miller and Hull established The Miller Hull Partnership in Seattle in 1977. 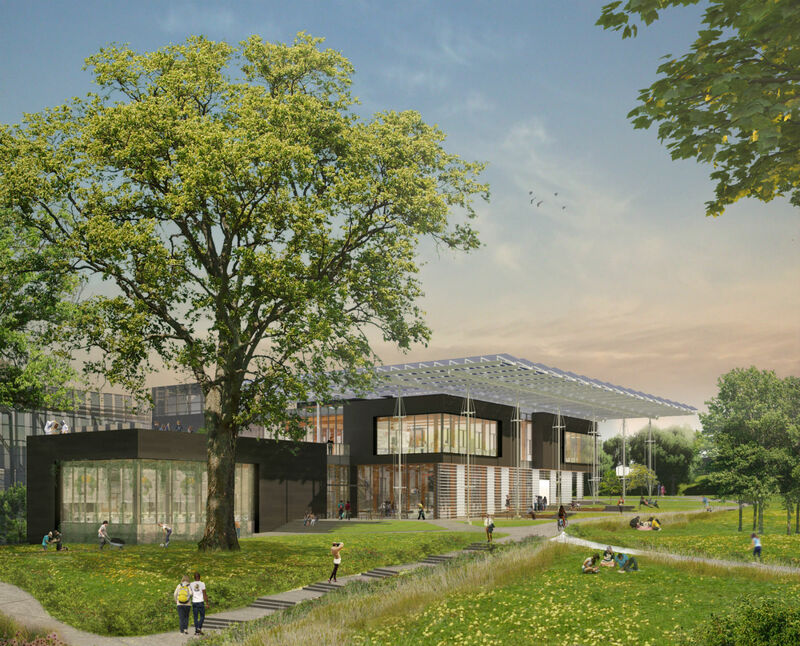 Hull’s design credits include projects throughout the Pacific Northwest and in San Diego, notably The Open Window School, Epiphany School, Bertschi Center, and The Bush School, all in Seattle, Conibear Shellhouse at the University of Washington, Seattle Pacific University Science Building and University Center for Performing Arts, Discovery Park Visitors Center, and Fisher Pavilion at Seattle Center, Tillamook Forest Center and Yaquina Interpretive Center in Oregon, The Wharf and Pier 32 in San Diego, and a number of private homes throughout the San Juan Islands. Hull had recently returned to Afghanistan, where he was at work on both a health clinic and a girls' school. Hull and Miller jointly received the AIA Seattle Medal of Honor in 2010, seven years after their firm earned the 2003 AIA National Firm Award for sustained design excellence. The pair were also awarded the Washington Alumni Achievement Award in 2006. Hull was an accomplished public speaker and a mentor to many younger employees at Miller Hull. “Hull was regarded for his natural ability to grasp the essence of a project and translate it into an inspired physical manifestation of client values,” the firm said in a statement. “His buildings fit amazingly well in their setting—urban or rural—and were extremely comfortable to occupy, but most of all, they were beautiful.” Hull’s family held a private funeral service in Cape Town, South Africa on Sunday, April 13, 2014. The date for a public Seattle celebration of Hull’s life will be announced soon.